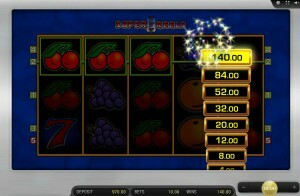 Super 7 Reels is a video slot machine that captures the simplicity and allure of one-armed bandits. You’ll still discover slot games like this in pubs and roadside shops, but online, there tends to be an emphasis on doing as much as possible with the available technology. That’s not a bad thing, but getting back to basics is a good thing sometimes, and it reminds us of what we really love about slots in the first place. The symbol set includes the usual suspects: cherries, lemons, oranges, plums, stars, grapes, watermelons and sevens. One notable difference here from most classic machines is that there aren’t any bar symbols. The game offers stars instead, and they have a special feature that helps change up the classic formula. Another twist is that the game has five reels and five bet lines rather than three. They’re all automatically active each spin, and spins range from $0.10 to $10. 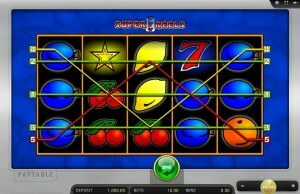 Super 7 Reels is a Merkur fruit machine. Fruit machines are the classic slot configuration, and back when they were first introduced, slot machines didn’t have themes and stories. In fact, that type of branding and storytelling didn’t become prevalent until electronic slot machines were widespread in Las Vegas, which happened during the mid-1970s. 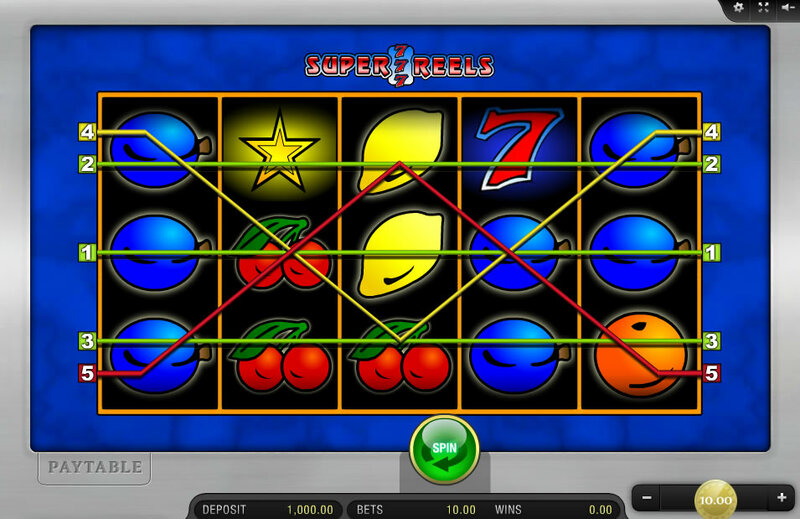 The mission here is to simply get three fruits or other symbols consecutively on a bet line. Simplicity is the great benefit here. Reels spin very fast, and you can identify wins easily. You can even calculate the odds in your head, which is something that can’t be said for most modern slot machines. A slot machine like this may not offer enough to keep the modern slot fan’s interest for long periods, but games like this are excellent palate cleansers and deserve a spot in anyone’s rotation. All symbols pay out with just three symbols, and the amount increases with the fourth and fifth. Symbols must be consecutive, but they don’t have to appear left to right as is the case with most slot machines. In other words, if you get a seven on the second, third and fourth reel on the same row, you win. The one exception to this rule is the star symbol. The star takes the place of bar symbols and serves as a scatter. You only need three stars anywhere on the board in order for the scatter to pay out. The seven is the jackpot symbol. Five sevens is worth 10,000 coins or an impressive $100,000 at the max coin size. 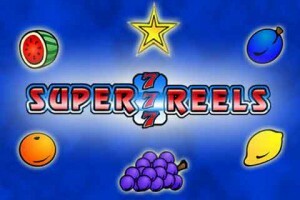 Super 7 Reels is a fantastic game because it provides everything slot fans love about classic fruit machines without being exactly the same as every other fruit machine you’ve played. Not having bar symbols present may seem a little strange, but the stars will quickly help you overcome that. Landing three stars isn’t that unusual and helps you avoid long ruts. 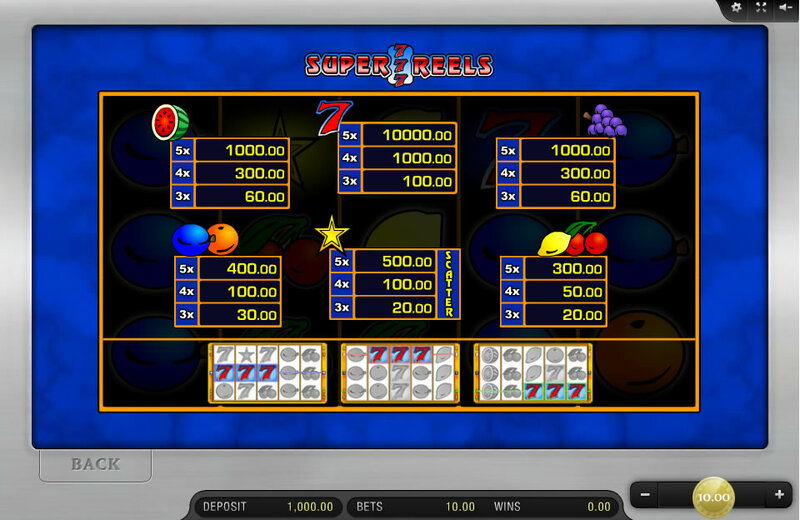 The game also has a convenient Auto Start features that lets you automate between five and 100 spins, and it will automatically cancel the series when you hit a winner. This makes it a great choice when you just want to sit back and relax or, as mentioned earlier, a nice change of pace when you simply need a breather from the more elaborate online slot games.